Jared Smith declared a four-way tie for first place. I think you will find these poems moving, too. Congratulations to Judith Tullis, Mary Cohutt, Peggy Trojan and Gail Goepfert. Their poems are presented here in the order in which they were received. If you are a poet, and did not have time to try the December prompt, this might encourage you to give it a try one of these days! the thrill of romance, the ache of lost love, the loneliness of widowhood. and carry you to the hallowed ground of your family. to the table and sat waiting. congealed on the china before me. my cheek when I kissed you goodnight. Copyright of individual poems remains with the authors. Check back at the beginning of January for a new challenge. Many times since the death of my grandmother I have wished I could sit down with her and talk as we used to talk. There are questions I wish I had asked her, and things I would like to tell her. I’d like to discuss some of the ways she impacted my life, tell her about some of the decisions I made, and introduce her to my children and grandchildren (none of whom had the privilege of meeting her). Some day maybe I’ll write her a letter. It would be especially appropriate for me to write the letter as a poem, since my grandmother loved poetry. One of the main reasons I was attracted to poetry is that she recited poems to me from memory, and also wrote a few poems of her own. Jared Smith has authored at least six books of poetry, and has had his work adapted for the stage at the Lincoln Center for the Performing Arts in New York, as well as in the Chicago Suburbs. He has served as a screener, board member, and advisory board member of The New York Quarterly and as poetry editor of Trail & Timberline. Smith says it took him thirty years to find the right words and the time to write the following poem, addressed to his father. The lines do not appear quite as they do in Smith’s book, because he writes in longer lines than this blog permits. Consequently, I have double spaced the lines and let the longer lines fold into the next line. Those spaces thus are the line breaks. Where Smith put a stanza break, I’ve put two blank spaces, to distinguish it from a line break. Also, in the published version, the title appears farther to the left on the page than the rest of the poem. among choices you have left behind. the badges worn across your chest, dust like the degree from Harvard. for your descendents to walk among. flaring itself into a place you have come to know. with no more power in their roots to shade your window. and dwarfs a house on the other side of town. tickets please. Sandwiches in paper bags. igniting them so that they are torn apart and scattered in the solar wind. or spend long years sweating our fears into foreign sheets? on vacation beneath a Minnesota sky. and the light in your eyes seemed to go on forever without finding words. with no desire to pass it on. The challenge for December is to write a poem as a letter to someone who has been physically gone from your life for at least a decade, but still impacts your life. You may write in free verse or in form. If you use a form,specify the form you are using. The deadline is December 15, 2010. Poems published in books or on the Internet (including Facebook and other on-line social networks) are not eligible. If you poem has been published in a periodical, please include publication data. Send your poem to wildamorris [at] ameritech [dot] net (substitute the @ sign for “at” and a . for [dot], and don’t leave any spaces). Or you can access my Facebook page and send the poem in a message. Be sure provide your e-mail address. Submission of a poem gives permission for the poem to be posted on the blog, if it is a winner. The deadline is December 15. Copyright on poems is retained by their authors. It was difficult to judge the November poems - there were a number of excellent submissions. The two winners are both free verse, but written in very different styles. Congratulations to Mary Cohutt and Jean Waggoner! Mary took a scientific concept with which most people are familiar and lets us view some ways it plays out through the seasons. There may not be anything in the poem we did not already know, but her images help us see gravity in new ways. Jean's poem, on the other hand, may teach many of us something as we read about two related trees. so redolent of green Byzantium. and savors a crush of agave at its roots. the other a repellent shrub. Science plays an important role in modern societies, as do many of the phenomena which scientists attempt to describe and understand. Sometimes we may be tempted to think everything that can be known is known, but biology, chemistry, physics, astronomy, and the other sciences keep evolving. The wedding of science and poetry can create very interesting results. Larry Turner’s sonnet, “Biology Class: Her High-School Teacher is Filled with Certainty (1985)” is part of a small chapbook entitled The Girl with Blue-Eyed Parents (Fredericksburg VA: 2001). This collection has ten poems, all about Susan and her family. Two of the poems, including “Biology Class,” were reprinted in Turner’s later collection, Eden and Other Addresses. Another student, Tim, lifts up his hand. The teacher speaks, “I’ll tell you what it means. Are brown, their child’s can still be blue. Then Susan says, “I mean you no defiance. “No. Never could that be. We’re talking science. And tears flow from her eyes of deepest brown. Used by Permission of the author. From Eden and Other Addresses (West Conshohocken, PA: Infinity Publishing Company, 2005), p. 55. The next poem, “Inertia,” is by Robert M. Chute, Professor Emeritus of Biology at Bates College. For this poem, Chute draws on a theory from physics. The collection in which it appears has poems dealing with chaos, chance and randomness. Evolution, quantum theory and geology inspired Chute to write some of the poems. Ants and homing pigeons appear together in one poem; the human heartbeat and a mating Mayfly, in another. Chute reveals in the introduction that he goes to the periodical section of the library not to read Poetry, but to read the British periodical, Nature (and its North American cousin, Science). It was difficult to select just one poem from his book, Reading Nature. Reading Nature (Topsham ME: Just Write Books, 2006), p. 14. Permission granted by the publisher and the poet, Robert M. Chute. Robin Chapman, Professor Emerita of Communicative Disorders at the University of Wisconsin-Madison, has won a number of awards for her poetry, including the Posner Poetry Award for her collection, The Way In, and the 2007 Cider Press Review Book Award for Abundance. Julien Clinton Sprott, a plasma Physicist, at UW-Madison, is the author of hundreds of papers on such topics as chaos, fractals and complexity. He has also published as several books. Chute is also known for his video series, Wonders of Physics, a total of 22 hours of programming. At UW-Madison, Chapman and Sprott partnered in a weekly interdisciplinary Chaos and Complex Systems Seminar, in which many colleagues participated over the years. Topics taken up ranged from chaos in plasma and the spots on buckeye butterflies to chaotic compositions for string quartets and the dynamics of happiness. The seminar led to collaboration on a book filled with Sprott’s stunning computer-generated images that follow from chaotic attractors and dynamical systems along side Chapman’s arresting poems, inspired by the seminar, Sprott’s images and scientific theories. The authors help the scientific layperson by including definitions of such terms as dynamical system, attractor, bifurcation and entropy. However, you don’t have to understand fractals to appreciate the beauty of Sprott’s images, nor do you have to be a Ph.D. scientist to appreciate Chapman’s poems in this amazing coffee table book. What’s not changing in time? before frost take root and flower. Outside, a wind is blowing the leaves about. laughing, to the music of the nickelharppe. what strange, unpredictable pattern is yours? Used by permission of the author. From Images of a Complex World: The Art and Poetry of Chaos, by Robin Chapman and Julien Clinton Sprott (World Scientific, 2005), p. 4. A different kind of collaboration led to Two Off Q: a conversation in poetry, by June Nirschl, a retired English teacher, and Judy Roy, retired from careers as a psychologist and then as a French teacher. Two Off Q received an Outstanding Achievement in Poetry Award from the Wisconsin Library Association. Many of us have tried to understand what we have heard about string theory, and have contemplated what it might mean in practical terms. Judy Roy put her thoughts into a very interesting poem which takes us from contemplation of her parents and grandmother to a surprise ending. which I gave to Goodwill years ago. may be God’s voice, singing. Used by permission of the author. Two Off Q: A Conversation in Poetry by June Nirschl and Judy Roy (Marshfield WI: Marsh River Editions, 2008), p. 13. * Judith Strasser’s collection, winner of the 2006 Lewis-Clark Expedition Award from Lewis-Clark Press, The Reason/Unreason Project . * “Science Experiment,” from Breaking the Map by Kim-An Lieberman. * I Marveled at How Generally I Was Aided,” from The Best of It: New and Selected Poems by Kay Ryan. * “String Theory,” from Broken Strings, Missing Notes: ...Strengthening Democracy and Seeking Justice in by Larry J. Eriksson. Republished in Peninsula Pulse at http://www.ppulse.com/Articles-c-2008-09-03-80111.113117_String_Theory.html. * Ronald Wallace, “String Theory,” Redactions (2009). The poetry challenge for November is to write a poem related to, responding to or reacting to, a scientific theory or principle. You may write a formal poem or free verse. The deadline is November 15, 2010. Send your poem to wildamorris [at] ameritech [dot] net (substitute the @ sign for “at” and a . for [dot], and don’t leave any spaces). Or you can access my Facebook page and send the poem in a message. Be sure provide your e-mail address. Submission of a poem gives permission for the poem to be posted on the blog, if it is a winner. The deadline is November 15. Winning poem or poems will be published on this blog. The October challenge was a popular one. There were more entries than any previous two months combined. The poems, including the four printed below demonstrate that the prompt, to write a poem on the subject, “where I come from,” can inspire an interesting poem regardless of the poet’s cultural context. The poems were judged by Barbara Eaton, Vice President of the Illinois State Poetry Society and Contest Chair for Poets & Patrons of Chicago. She has a Ph.D. from the University of Maryland. She teaches part time at the College of DuPage and serves as a dramaturg for the First Folio Shakespeare Company in Oak Brook, Illinois. She picked winners for first, second, and third place and, as we discussed the poems together, we agreed to add a fourth place winner. Note that two of the lines in the fourth place poem, "I Come from the Grace of a Farm," were too long for the blog format and folded onto the next line. Also, the uncapitalized lines in the third place poem, "Maddening," should be indented. Unfortunately, I am not able to indent on this blog. The poem has some rich images and an ending which fits very well. It was one of several poems with rural backgrounds. Third place goes to “Maddening,” which the judge said “has great images and imagination.” There is a haunting quality about it. The second place poem has an interesting and appropriate title and an especially strong ending. under the reflection of a red sun. along thousand miles of the Yangtze River. “Golf Clubs and Hugs” was chosen as the first place winner in part because it was so well integrated and coherent. The poet made excellent use of repetition; when a word or phrase was repeated, the context often changed just enough to make it interesting. The ending of the poem circles back to the mother’s hands and the father’s golf clubs, both of which played a part in the first stanza. for his sons and ignored the daughters. our cheeks full of roses. where he stroked and swung and bested most. returning to dust and water. born of blood and water. weaving wheat into roses for you to see. I am my best friend now. Congratulations to the four winners! The poems remain the property of their authors, and should not be copied without their consent. Glenna Holloway, who wrote the sample (prize-winning) Dorn Septet posted in June, has selected a winner for the Dorn Septet Challenge. Congratulations to Indiana poet, Reason A. Poteet. in school, my trust in God was taught as truth. my church, the place I go as wonder perserveres. in school complied with ev'ry task assigned. attend a church where needy folk complete their quest. to heav'n where all can rest. of truth from youth to everlasting life. is sheer perversion, trust denied - inept. Two winners were selected this month, one in which flowers are a metaphors. Lucy Lu’s poem was selected in large part because of the imagery and the flow of the couplets. In Ann-Marie Madden Irwin’s poem, the narrator is planting daffodils. The experience of the narrator is specific and individual, but in another way, it is universal. It is not unusual to experience a sense of the presence of a loved one in a way that seems very real. aquiver with such gentle touches. or April that beautifies snow? the last snowflakes from treetops. the way she felt on the inside. forever and yet not ever again. promise of trumpets come spring. as her face set, she continued digging. Copyright on these poems belongs to the poets who wrote them. Thanks to the consulting judge for August, Kathleen Gustafson. There is a long tradition dating back at least as early as the Song of Solomon (6:2-3) of using flowers in love poetry. A favorite song from 17th century Scotland begins “O my Luve's like a red, red rose/That’s newly sprung in June.” Robert Burns was concerned to save the folk music of Scotland. According to one account, he heard a country girl sing these words, and recorded them for posterity. One of the best known poems about flowers is by William Wordsworth, written after he and his sister took a walk in the Lake District of England. From VISITING MORNING AND OTHER QUIET PLACES (Tradewinds, 2008). Note that Auld is neither sentimental about the beauty of dandelions, nor cranky about their presence on her lawn. The tone of the poem is, on the one hand, matter of fact: the dandelions come, stay for a while and leave as suddenly as they had arrived. Within this staid framework, however, Auld uses imagistic and metaphoric language to make us see the dandelions in a new way. They are “squatters” who “unpack” and “nuzzle in.” The “strewn puffs” are “golden pearls.” And when they float off, they leave their “trash” behind. CX Dillhunt writes about prairie flowers. There is deep feeling underneath the words: The prairie “takes me in,” the poet says. It tells him to stay, and he stays. 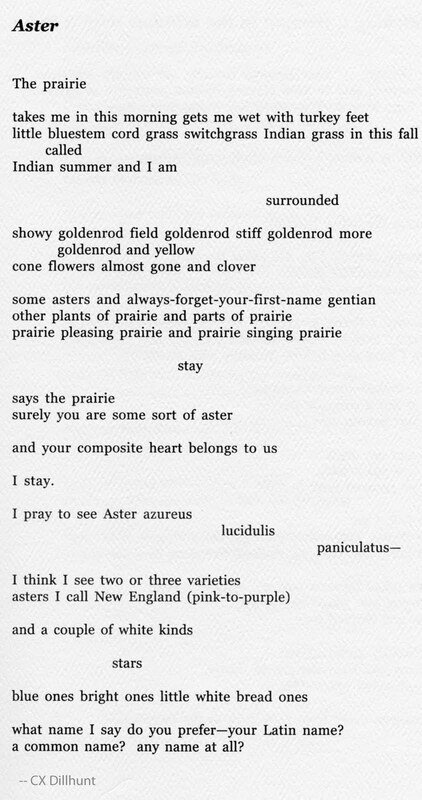 There is an element of the list poem here, as he names various kinds of flowers and, later, varieties of Asters. He uses both scientific names and casual descriptions, such as “stars” and “little white bread ones.” The ending is a surprise, as he addresses the flowers, asking what name—if any—they would like to be called. what name I say do you prefer—your Latin name? a common name? any name at all? The poem appears in the box above to show the lay-out Dillhunt chose for his poem. Unfortunately I am unable to retain that layout in this blog. Does the layout remind you of a stretch of wild prairie? 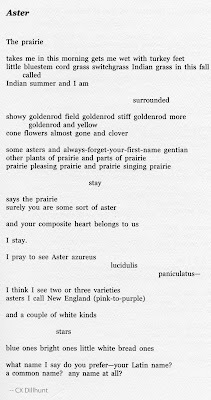 "Aster" is from Girl Saints (Madison WI: Fireweed Press, 2003), p. 19. Judy Roy’s poem “White Lilacs” can be called a love poem. It is also, however, ekphrastic poetry. Roy is responding not to lilacs in the garden or in a vase on the piano, but to lilacs (and burgundy roses) in a painting by Marc Chagall. Two Off Q: A Conversation in Poetry by June Nirschl and Judy Roy (Marshfield, Wisconsin: Marsh River Editions), p. 50. The challenge for August is to write a poem about a flower or flowers without being sentimental or trite. Will your poem be a formal poem or free verse? Will you use scientific or every-day terms or both? Metaphor or simile? Alliteration or assonance? Will the flower or flowers be symbolic? What new thoughts will the reader have about flowers after reading your poem? Poems published in books or on the Internet are not eligible. If you poem has been published in a periodical, please include publication data. Send your poem to wildamorris [at] ameritech [dot] net (substitute the @ sign for “at” and a . for [dot], and don’t leave any spaces). Or you may send your poem in a message. Be sure provide your e-mail address. Submission of a poem gives permission for the poem to be posted on the blog, if it is a winner. The deadline is August 15. The Dorn Septet Challenge is open until September 15. The septet must reflect all the qualities of a Dorn septet as described in the June Challenge, and must have a minimum of three stanzas. Poteet shares many of her poems on her website at http://www.wordchimes.com/poetry/Index.php?viewpoet=514. the echo dissolves, the bell leaves its ghost in my palm. the finger folds back to my uncharted lines. its flesh dissolves to free its single sleeping seed. another year dissolves, weightless at each breath. Copyright on posted poems remains with the poets who wrote them. Thanks to Katie Kingston, who judged the top poems for this month’s blog. Katie is an award-winning poet. Her books include In My Dreams, Neruda (in English), In My Dreams, Neruda (Spanish Edition) and El Rio de las Animas Perdidas en Purgatorio .